As we begin to approach another beautiful New England spring season, the time to start planning an outdoor adventure is almost here. One the of best activities to enjoy the transition to spring is by visiting a local park or nature center to take in all the beauty nature has to offer. From the local park to out of state nature preserves, New England boasts some of the best outdoors in the nation. For those who want to stay local, we want to help plan your next trip by highlighting some of the best outdoor parks and nature centers near Stamford. Enjoy! 1. Stamford Nature Center - This beautiful 118-acre property is located less than 15 minutes away from the Residences at Bedford. Home to a wonderful collection of more than 80 acres of walking and hiking trails, the Stamford Nature Center combines convenience with excellent outdoor exercise. For those not as interested in hiking, the Stamford Nature Center is also home to the Stamford Museum which boasts wonderful exhibits for kids and adults to enjoy. Hours of operation vary by day and tickets can be purchased by visiting the nature center’s website. 2. Cove Island Park - Located minutes away from Holly Pond, Cove Island Park is an 83-acre park and beach located in the cove section of Stamford. 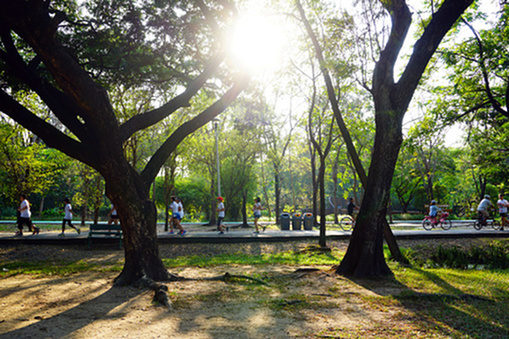 Maintained by the state, the park includes a walking and running trail, children’s play area, and a rollerblade/ cycling path for residents to enjoy. Rocky shorelines around the cove offer a great place for anglers to fish and excellent viewpoints for picturesque moments. Residents should consult the city’s website to see hours of operation and parking fees at their website. 3. Fort Stamford Park - For history buffs, Fort Stamford Park is a fusion of Stamford history and outdoor beauty that makes it one of the top local places to visit. Home to many archaeological remnants of military works erected during the Revolutionary War, Fort Stamford also gives way to beautiful views of the Mianus River and Long Island Sound. While small in size compared to the Stamford Nature Center and Cove Island Park, Fort Stamford Park still boasts wonderful scenery mixed with historical works of art. Please visit the city’s site to view operation hours and parking location.